Located in the Konakli district just a 10 minute drive from the popular resort of Alanya- this elegantly styled beachfront hotel has an enviable position over-looking the Mediterranean Sea. Built on 20-000 sqm of land- the hotel features conference and banquet facilities and is also an ideal place for families who can enjoy the outdoor facilities and watersports and relax in the complex's spa and wellness centre. 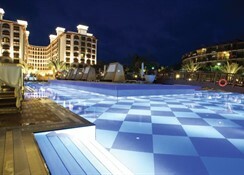 Public transport runs nearby with links to Alanya and other resorts along the coast. 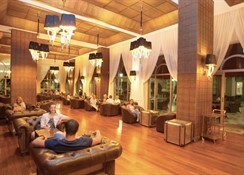 There are a choice of bars and a main buffet and a la carte restuarants for wining and dining. (Some facilities may not be operational year round due to weather/seasoanl conditions). I would like to inform you that the honeymoon couples should get married maximum 1 month before their stay and should represent a valid certificate in order to get honeymoon concept at QUATTRO BEACH SPA AND RESORT.